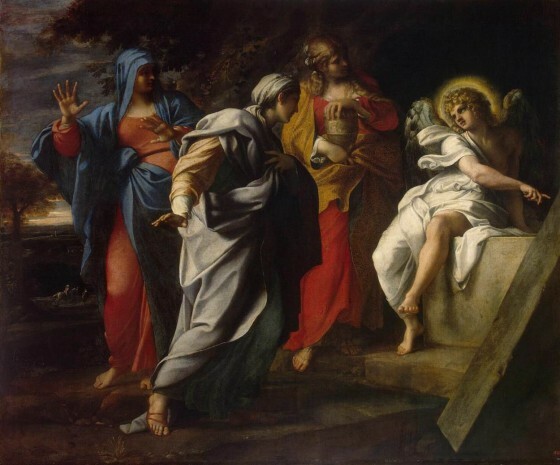 Annibale Carracci, . 1560-1609 ("Holy Women At Christ's Tomb") Bologna school, Italy. The Resurrection of Christ: Historical or History Making. historical artifacts to rationally warrant belief. .
Luke's Jerusalem sightings, the problem is in timing, but is it a real problem? at the tomb were real people. Did Mark Invent the Story of the Empty Tomb? in circulation before the Gospel of Mark existed. Resurrection Accounts, Transmitted Faithfully From the Beginning. General arguments on the reliable transmitting of the early Gospel events. The theory that since most crucifixion victims weren't buried, Jesus wasn't buried and the empty tomb is just a myth. The "no Body" theory comes in two versions: (1) that Jesus was an historical figure, but his resurrection was non-bodily; he didn't leave an empty tomb but just appeared to people as a spirit; (2) or that he never existed, and in fact Paul didn't really believe that he was a real a flesh and blood person, but merely a mythological figure or ethereal personage; the object of worship of a mystery cult. There's a Good chance we do know where the Tomb is, under the chruch of the holy seplechur. lines underneath the different versions.